Kinshasa (Agenzia Fides) - In a raid of alleged Ugandan rebels of the Allied Democratic Forces (ADF) against the Congolese city of Beni and in the municipality of Rwenzori and Beu, northeast of the Democratic Republic of the Congo (DRC), at least 14 civilians and 4 soldiers have been killed, while hundreds of others have been injured. 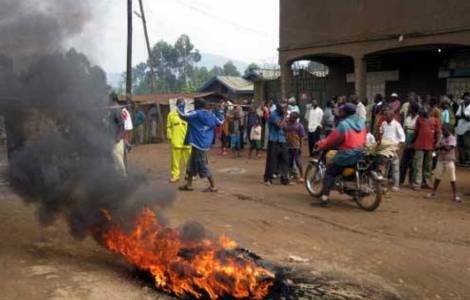 According to information sent to Fides, the rebels reached the town, on the border with Uganda and close to the town of Beni, north Kivu, on the night of Saturday 22 September. Mgr. Sikuli Paluku Melchisedech, Bishop of the diocese of Butembo-Beni, urged government forces and the Mission de l'Organisation des Nations unies pour la stabilisation en République démocratique du Congo (MONUSCO), to review their strategy against the ADF in Beni: "I especially express my condolences to the families affected who unexpectedly lost their loved ones in this unbearable tragedy and, in faith in Jesus, who is the resurrection and life, I recommend the souls of these innocents to the mercy of God", he wrote in the message sent to Fides. The Bishop called on government authorities "to better fulfill their responsibilities to protect the population, defend the territory and safeguard national sovereignty".